Born 26 June 1824, Belfast, Northern Ireland. 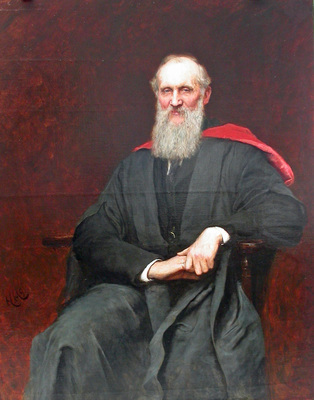 William Thomson, 1st Baron Kelvin (1824-1907) was one of the most famous scientists of his age. He was Professor of Natural Philosophy at the University from 1846 to 1899, Dean of Faculties from 1901 to 1903, and served as Chancellor from 1904 to 1907. He stood for Rector, unsuccessfully, in 1899. 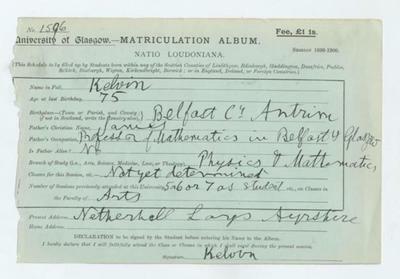 Born in Belfast, Thomson moved to Glasgow in 1832 when his father James became Professor of Mathematics. He and his elder brother James (subsequently Professor of Civil and Mechanical Engineering) matriculated to study at the University in 1834, but did not graduate. He went on to study at Peterhouse, Cambridge, and abroad before becoming Professor of Natural Philosophy at the University at the age of twenty-two. During his 53 years as a professor, Thomson taught some 7,000 students from all over the world, and established an advanced class in mathematical physics and a laboratory in which they could undertake experimental work. 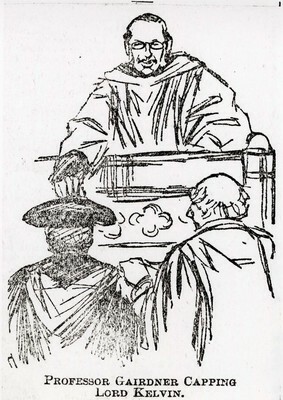 The laboratory students worked mainly on problems derived from Kelvin's own scientific and engineering research in electricity, establishing a "school of electrical engineering". Thomson was as famous for his inventions as for his academic work. He published more than 600 scientific papers during his lifetime and earned international acclaim for proposing an absolute scale of temperature now known as the Kelvin Scale and for his pioneering research in the fields of mechanical energy and heat. 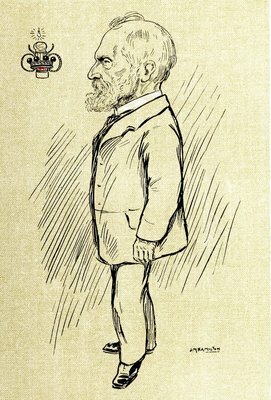 He was equally well-known for his work on planning the Trans-Atlantic telegraph cable and his invention of the Kelvin Compass and sounding machine. 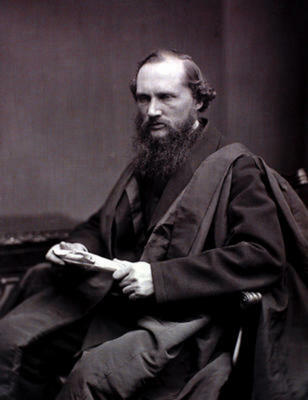 Knighted in 1866, Thomson became the first scientist to be elevated to the peerage when he was created Baron Kelvin of Largs in 1892. He died at his home in Ayrshire and was buried in Westminster Abbey on 23 December 1907.